“In anything worth doing, there is a necessary downside. 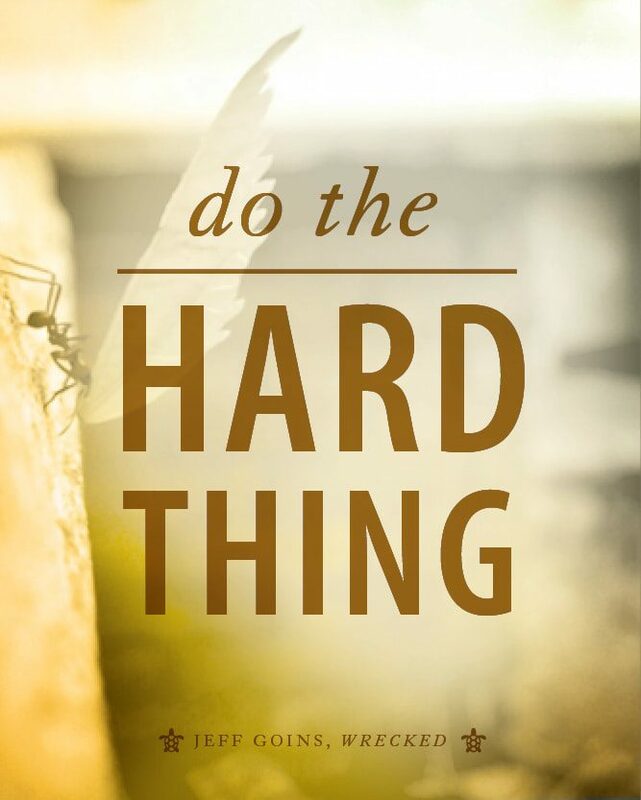 In order to experience ultimate satisfaction, you must embrace the hard things.” Jeff Goins, Wrecked. I got up early on Sunday morning and read Jeff Goins’ new book, Wrecked, in one sitting. Reading Jeff’s book felt a little like sitting down for a cup of coffee with an earlier version of myself, or perhaps an earlier version of my husband. In our early years, “idealistic” is certainly a word that would have described us. My now-husband (of nearly 20 years!) took me for a walk during our courtship and wondered aloud if God intended him to marry or stay single in order to keep his focus more solely on the his life’s mission. I quickly pulled my hand from his and our idyllic walk through Miami University’s Formal Garden ended in a serious discussion about the future. Our earliest plans/dreams together for our life centered on leaving the US to serve overseas. We thought the best thing would be the hardest, the one that would require the most sacrifice. So reading Jeff’s book, sprinkled as it is with stories of missionaries and people seeking to live sacrificially, returned me to that earlier phase of our lives. What I love about Jeff’s book is that he is not prescribing a singular path to living well, as we might have been tempted to do during our earlier adult years. Instead, he challenges readers to do the right thing, whatever it is, wherever they are. His idealism is one that is tempered by reality and an understanding that Wrecked looks different for everyone. What is important is being open and compassionate to the needs of the broken world we live in, to experience discomfort in order to bring about good for others, to make daily choices to make a difference. I wish I could beam this book to my 21 year old self, and I am glad for the way it is challenging me now. Though I’d like all my 20 something friends to read it, I hope everyone will. Sometimes my life feels a little too comfortable, and Jeff has challenged me to consider how I might stay open to what might be next for me in this adventure. “Don’t get me wrong: this isn’t a matter of beating yourself or trying to be good enough. That’s how we got into this mess in the first place. Rather, it’s about living in the tension of a broken world and being content with the journey, not conjuring some contrived sense of arriving.” Jeff Goins, Wrecked. I am honored to be a part of Jeff’s launch team and received an advanced copy of his book. Since my business includes using social media to launch books, I loved seeing Jeff’s strategy and approach, shared here by Maria Keckler. I also loved seeing his early success on launch day yesterday. Jeff is celebrating his launch this week by giving away a bunch of free gifts with the purchase of his book. I hope you’ll buy a copy (or three) and share them with friends. And I hope you will join me in considering what it might mean to welcome discomfort for the sake of others. Great post, Becky. And I agree, I wish I could beam this book to my 21 year old self too! However, my almost 40 year old self is learning so much from it as well. Even though I’m a 40-something version of myself right now… I think I have much to gain from reading this book. My husband and I are in a huge season of change and transition right now. Only God knows what the future holds. On another note, there’s a picture of a woman next to my name when I post a comment on this site, but it’s not me. Weird, huh? Can you fix that? I was trying to put a finger on what I was feeling when I read the first few pages. It reminded me of that 20-27 yr old time when I was in college and doing urban ministry and wanted to use all of my ‘wisdom’ to jar people out of their comfort. But Jeff makes the same challenge (without all the post-collegiate bravado and self-righteousness). I look forward to reading further because, honestly, sometimes I mourn the loss of some parts of that crazy 20-something. How Do You Tap Into Your Courage?